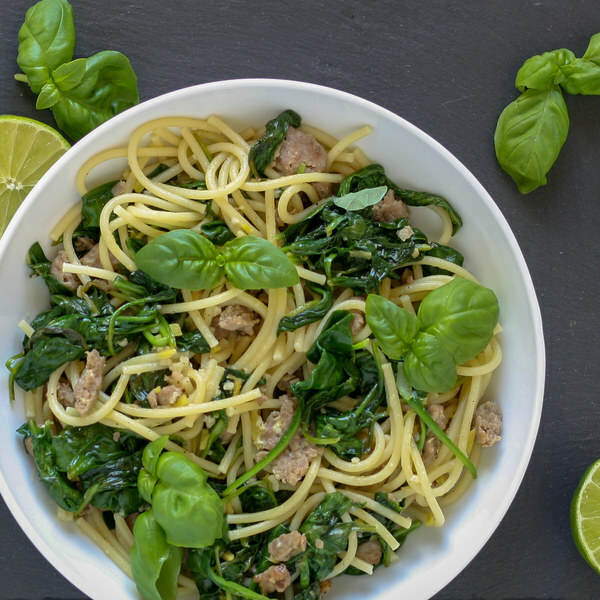 ← Asian Pork Noodles with Lime, Basil & Spinach. When the water in the saucepan comes to a boil, uncover the pan and season the water with salt (snap the spaghetti into thirds as you add to the water), then add the pasta and stir for a few seconds. Cook the pasta, uncovered, for 11 to 12 minutes (or according to package directions). Once cooked, drain the pasta in a colander. Peel and mince or press the garlic. Peel and mince or grate the ginger. Juice the lime into a small bowl. Turn the heat down to low and add the spinach and half the basil, stir until the spinach is wilted. Add the pasta, lime juice, fish sauce, salt, and pepper. Cook, stirring constantly, until ingredients are well combined.